De Grey Mining is a West Australian mining company that centres on the development of gold. additional joint venture and option agreements to the south providing De Grey with the right to earn between 70-80% of separate tenements in the southern portion of the project area. The main tenement area is the Farno McMahon ground, where the joint venture partner is Novo Resources of Canada. Apart from the potential to further increase resources, and the additional 3.47Mt of base metal resources, are located on granted exploration and mining leases owned either 100% by De Grey or within the Indee Gold tenements where De Grey holds the right to acquire 100%. Toweranna where the very limited historical drilling has shown mineralisation to 350m. The under-explored nature of the mineralised structures coupled with 5 partially tested large gold systems and over 40 untested gold anomalies provides confidence further discoveries will be made within the project area (ASX Announcement “Annual Report 2018, 29/10/2018). 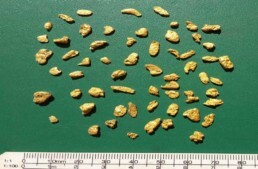 For more information about the Pilbara Gold Project, click here.